Stacy Tilton Reviews: Is there anything more universal than Duck Tape? Is there anything more universal than Duck Tape? I'll be the first to admit I'm not always the most crafty or creative amongst my group of friends. Yes I can think of fun things to do, but I am not the best at coming up with things to create without at least a little inspiration. Thankfully there are books and websites full of ideas out there to help me along because I have a 10-year old daughter that LOVES to craft. Recently we started dabbling in crafting with Duck Tape. Years ago when I was growing up there was the old stand by gray Duck Tape that you used for pretty much anything that needed a little fixin'. It was your stand-by and the universal fix-it-all. Fast forward to the new millennium (so to speak) and you have probably hundreds (don't quote me on that because I don't know the exact number) of colors/styles/patterns/types of Duck Tape to choose from. It's not just for holding things together, or patching up holes anymore. Duck Tape is a crafter's staple supply now days. I know we have at least a dozen different rolls laying around at any given moment...probably more if I could find them all. With a little creativity and lots of Duck Tape my daughter had ourselves a little crafting party to get her ready for back to school. 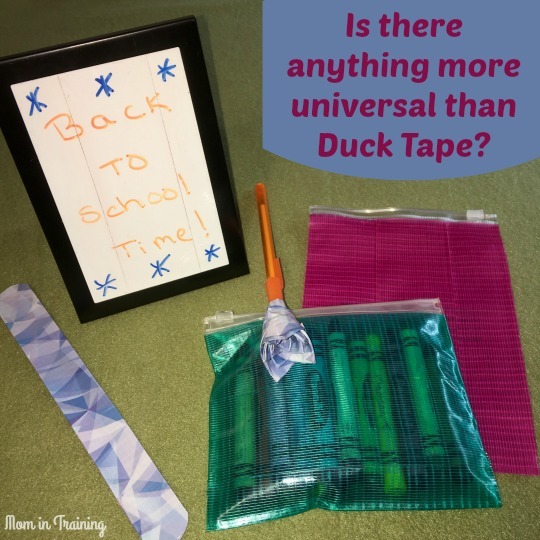 We had a lot of fun coming up with ways to use Duck Tape to add some flair to basic supplies. I really like their transparent tints and how they can turn a simple clear pouch into a fun colored pouch that you can still see through. Using the dry erase tape is still a work in progress for us, but I'm sure we will come up with some fun ways to use it. Maybe as a top and bottom border instead of filling the entire frame next time so it doesn't overlap. And for those of you that might be like me and need a little help coming up with ideas here's a fun book you can check out. 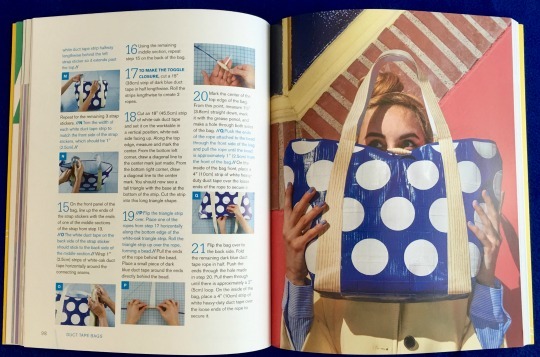 It's called Duck Tape bags and has step by step instructions on how to make bags of all shapes and sizes using Duck Tape. I'm thinking this one is really cute and wouldn't it make a great bag for shopping? Okay so maybe I'm getting a little crazy with the Duck Tape, but why not? Life's all about having fun and getting (or at least trying to) creative! Duck tape is like The Force: it has a dark side and a light side and holds the universe together. I use Duct tape for so many things. It really comes in handy. I like that if I need to use it that I have a couple of rolls for an emergency! That's quite an interesting duck tape bag! Very unique! I have never crafted using duck tape before, but it looks fun. If you want a lot of great crafting ideas, go to Pinterest!! I love all of the prints that you can now buy duck tape in. There's so many fun things that you can create with them. I wish that when I was growing up they had offered them but all we had then was the grey.